Serendipity means “the gift of being able to make delightful discoveries by pure accident.” These are the petals of the Mayflower. Where Auguste grew up in the country, the tiny blossoms of the Mayflower, first flower of Spring, lay hidden beneath their dark green leaves in the forest where only a determined child could find them to bring home to Mom for Mother’s Day. Encountering these fragrant blossoms, even as an adult, feels like a serendipitous event! The Serendipity Pendant measures 3.25cm by 3.75 cm (1 ¼ by1 1/2in). I love my Serendipity pendant! 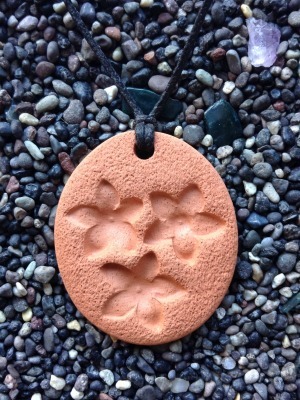 The Terra Cotta piece is not too thick, which I appreciate in a piece of jewelry. The design details are beautiful and precise. The leather string is adjustable so I can leave it long, or shorten it depending on the outfit I’m wearing. The stone holds the scent of my essential oils well and I can enjoy them all day long. Overall, a great purchase and I can definitely recommend this diffuser necklace!